Keeping your fleet in tip-top shape is what keeps your business moving forward. Taking trucks off the road affects your bottom line, so it is important to conduct regular maintenance checks to prevent out of service violations. Every month, Transportation Data Source (TDS) puts together a report on the number of safety violations collected from the Federal Motor Carrier Safety Administration’s (FMCSA) Safety Measurement System (SMS). Some of the violations cause mandatory out of service orders, and others are at the police officer’s or Department of Transportation’s safety officer’s discretion. For example, one inspection could have a brake violation and the vehicle is not put out of service, yet some inspections could have the same exact violation and be put out-of-service (OOS). In the month of March, there was a total of 291,198 inspections in the U.S. From those checks, 272, 101 violations were reported – some vehicles had multiple infractions. And 16 percent resulted in trucks being put OOS. Below is a list of the top ten most common violations in the Month of March that could have put a truck OOS. The report that TDS compiles from the data simply states yes or no about whether or not the violation occurred during a safety check. 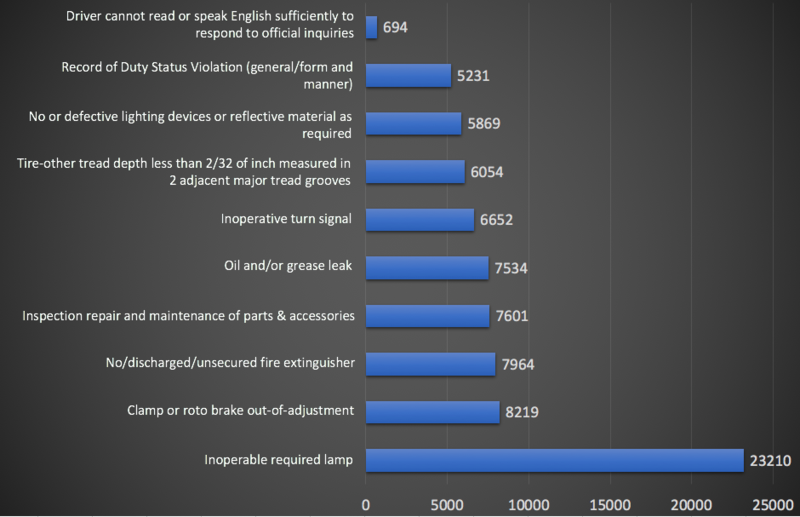 TMW System’s fleet maintenance solution can help prevent the top seven violations on this list. If a TMT Customer used the TMT First Step product and performed a triage at the Inbound and Outbound Safety Lane, they could catch Vehicle fault codes, preventative maintenance (PM) that are due, inspection tickets, and work pending orders. A Driver Vehicle Inspection Report, which should be conducted before and after a driver makes a trip, can create inspection tickets, which can be closely tied to pending work orders for the equipment. Below is a description of what each violation means. Inoperable required lamp. The total number of infractions was almost three times as many as the second most common violation. One of the most common DOT violations are lighting defects or faults. While the technology has improved, the problem hasn’t gone away. A bad turn signal is an automatic OOS violation. In addition to having a turn signal out on either side, other DOT OOS violations for lighting occur when: both headlamps are inoperative, both tail lamps are inoperative, or both stop lamps are inoperative. Clamp or roto type brake out-of-adjustment. This problem is consistently near the top of the list when it comes to most frequent infractions. With the number of miles that trucks travel and how often trucks need to brake, it’s no secret that these parts wear out quickly. No/discharged/unsecured fire extinguisher. The DOT requires that every truck transporting hazardous materials must have a working fire extinguisher on-board that has a clearly labeled expiration date. Inspection repair and maintenance of parts and accessories. All carriers are required to systematically inspect, repair and maintain all parts and accessories of its entire fleet. Oil and/or grease leak. Not only are leaks violations, but they cause further wear on the parts of your vehicles. This can cause larger issues down the road. Inoperative turn signal. Sometimes lights go out while the truck is on the road. But this issue is something that is easily fixable and preventable. Tire-other tread depth less than 2/32 of inch measured in 2 adjacent major tread grooves. Tires are often overlooked during the safety inspection because most people only look to see if they are properly inflated. But when the treads are worn, it makes the truck more difficult to handle. No or defective lighting devices or reflective material as required. If your truck were to break down, the DOT requires that you carry lighting devices or reflective material to alert other drivers that you’re broken down on the side of the road. Record of duty status violation (general/form and manner). Drivers have to keep a log of the time that they spend on the road compared to the time they spend resting. This should be monitored by an ELD. Driver cannot read or speak the English language sufficiently to respond to official inquiries. Drivers are required to speak English so that they can respond to an officer’s questions regarding the safety of the vehicle. So, for fleet managers and maintenance executives, they can see the key drivers of maintenance operations costs and comparative life-cycle costs in black and white or living color. Improve technician productivity with intelligent touch screens that simplify hours tracking, repair order completion and parts retrieval or re-orders. Manage mechanic productivity, track lifetime-to-date cost per mile, drill into unit histories, schedule PM's due and track all important reasons for repair with an intuitive system that works the way a great shop operation is supposed to. Going one step further, a fleet maintenance management software from TMW can help automate PM and service scheduling in sync with dispatch to minimize out of route miles and service downtime while protecting safety compliance and inspection records. While violations will never be totally eliminated, using a fleet maintenance solution can go a long way to reduce them. And, with advanced reporting and analytics, many of these violations can be avoided by identifying when a part failure may occur and proactively replacing it before it does. Ultimately, taking care of your fleet’s maintenance will keep your trucks on the road, which helps sustain your business and avoid costly fines due to violations. 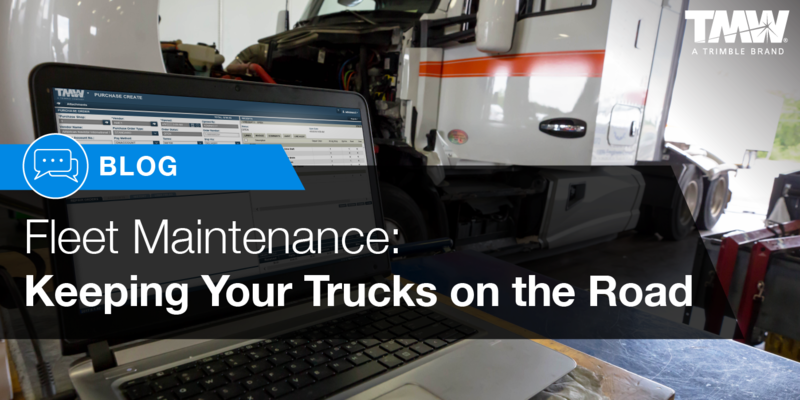 For more information about how to keep your trucks on the road and avoid the most common violations, visit https://www.tmwsystems.com/software-services/fleet-maintenance-software.